NDT Yacht is a Marine Surveying Firm that specializes in Non Destructive Testing of Boats and Yachts. Our clients are Boat Owners, Boat Builders, Repair Yards, and Insurance Companies. Dylan Bailey SAMS-AMS has over 30 years in the boating industry. And a life time on boats. He started at an early age working with his father, metal boat builder Howdy Bailey, where he learned every aspect of metal boat building and repair.Dylan has worked on the construction of metal, fiberglass, and wood composite boats and yachts. Dylan had a yacht management business for 20 years managing yachts of metal, wood, and fiberglass construction before becoming a marine surveyor 5 years ago. 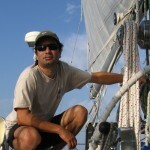 Dylan is a member of ABYC, SAMS, and Dylan was elected to the advisory board of the Metal Boat Society and serves as the Editor of the Metal Boat Quarterly. Dylan is a Level One Certified Thermographer.